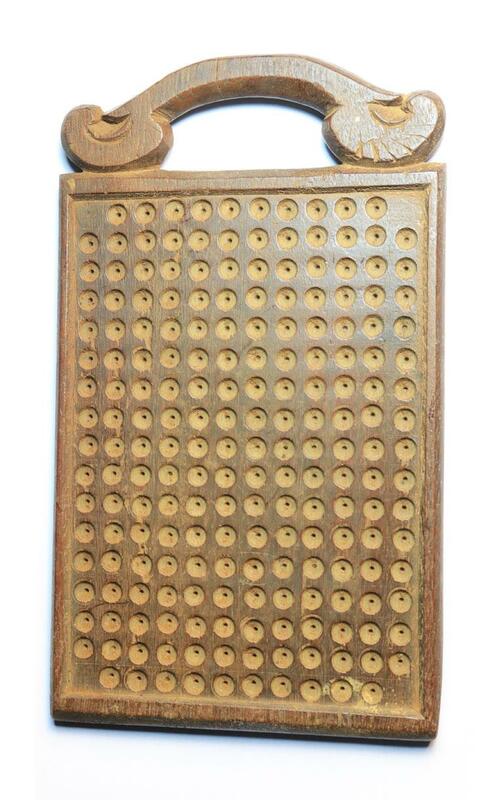 Coin Boards or Pana Palakas are rectangular and square shaped objects with small round slots. For counting purposes these boards contain 50, 100, 200, 500 slots according to convenience. Small coins like Rasi Panam, Silver Chuckram, Copper Cashes having been popular in Travancore were counted in the respective Chuckram board available. A handful of coins are placed in the board and are shaken gently from side to side to enable the coins to fall into the cavity. The surplus, if any, is swept out. When filled the board shows the exact number of coins it contains. In certain Pana Palaka a conversion table to convert Travancore Rupee to British Rupee is also engraved. The British Rupee is half Chukram more than the Travancore rupee, i.e. 28 Chukrams is equal to One Travancore Rupee whereas 28 ½ Chuckram is a British One Rupee. Travancore 1 Rupee was only a concept as there was no one rupee coin for Travancore.